I would love to be on the list for Fflewddur Fflam. If there are any leftover Tigger, I would like to be on that list if it’s not a problem. I know its a long shot, but please put me on the list for the Stitch PTD. I'll put my name on Stitch and Tigger, can't hurt to try! Could I be put down for Stitch and Tigger please? Who was the third PTD by the way? Just in case stitch makes it, can I request him? Thanks!!! Fflewddur Fflam is the bard from the Black Cauldron. It was a box office bomb and is considered to be a failure of a movie. In reality it’s one of the best Disney ever made. (At least in my opinion) it’s a very underrated movie and if you ever get a chance you should watch it. I have seen it and quite enjoy it myself. I just didn't see any pics of the PTDs and was curious. Yay! Another person who likes The Black Cauldron! It’s in the 2019 pin thread and the first page under PTD pickups. It’s awesome! I’d like to be added to the lists for the Tigger and Stitch PTDs, please! Thanks! I’d like a shot at the Stitch pin please. Pickup update - Stitch sold out before I could make it, but surprisingly Tigger was still available, so I picked up a Tigger and a Fflewddur. Ajk and Kerri780 like this. Got 253, so I’ll be able to get the release pins. 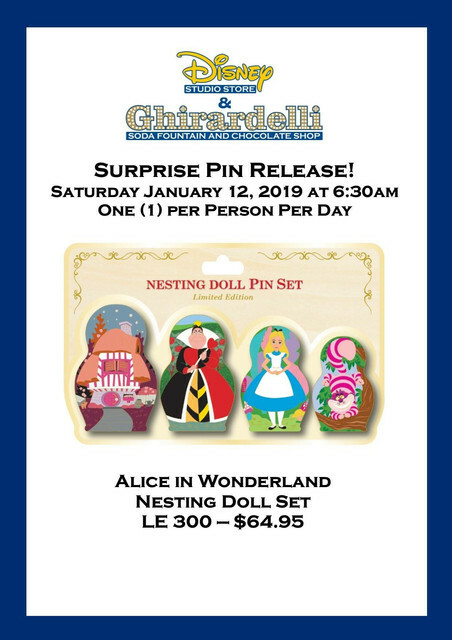 There is also a surprise nesting doll set. I’m putting the price at $75. I will pick up a set if at least one person requests it; the drawing would be open until Wednesday morning. Ajk and Stewbaws like this. Congrats (to all) on the great #! I would like to be put down for the nesting doll set. Pickup update - got the full cuties set, a nesting doll set, and a Fflewddur. Stewbaws and stitchismyspiritanimal like this. Please add me to Mary Poppins list. Thank you! I'd also like to be on the list for the Tigger PTD, assuming it's not too late to make such a request. Thank you! Even though I can't pick up any more Tiggers, the list is still open for people to sign up until the cutoff on Tuesday. Let's see who is observant. Kerri780, MerlinEmrys and Stewbaws like this.